Escape! Persist! Survive! Gather your wits about you and ready your trigger finger as you make your way out of the unforgiving battle zone that’s Tarkov. 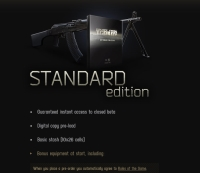 Get your fill of solid first-person shooter action with your very own Escape From Tarkov CD keys, codes, and user essentials. Check out our listings for more!